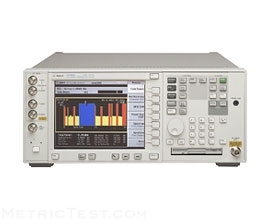 The Agilent E4406A (Keysight) vector signal analyzer (VSA) is a full-featured transmitter tester designed to meet the test needs of wireless equipment developers and manufacturers. For wireless base station and mobile transmitters and their components, the easy-to-use E4406A provides the best combination of speed and accuracy for a wide range of digital modulation analysis capability. And, with multiformat capability (GSM, cdmaOne, NADC, PDC, W-CDMA and cdma2000) the E4406A is the ideal, flexible choice for your production line. Easily configure one-button measurements with the simple, straight-forward menu structure and view them on the large, high-resolution color display. With built-in, standards-compliant tests and state-of-the-art digital IF technology, engineers can be confident that test results are accurate. And, when combined with the Agilent ESG-D series of RF digital signal generators, the E4406A VSA provides a powerful, transmit-receive test solution for wireless-equipment manufacturers. BRL Test - We Absolutely know Agilent Spectrum Analyzers. Our level of experience means that our repairs and calibrations of the E4406A are fast, affordable and done right. Call 407-682-4228 today for full circle solutions fit for realistic budgets.